Can quite different values be rationally weighed against one another? Can the value of one thing always be ranked as greater than, equal to, or less than the value of something else? If the answer to these questions is no, then in what areas do we find commensurability and comparability unavailable? And what are the implications for moral and legal decision making? In this book, some of the sharpest minds in philosophy struggle with these questions. The central aim of this book is to answer two questions: Are alternatives for choice ever incomparable? and, In what ways can items be compared? The arguments offered suggest that alternatives for choice no matter how different are rarely incomparable, and that the ways in which items can be compared are richer and more varied than commonly supposed. This work is the first book length treatment of the topics of incomparability, value, and practical reason. What is the nature of the reasons for which we act and what is the nature of the faculty of practical reason? What are normative reasons for action? What is practical irrationality and what are the requirements, permissions, and powers that explain what it is to be practically rational and irrational? What is the relationship between ethics and the philosophy of practical reason? This handbook will be essential reading for philosophy students and researchers in metaethics, philosophy of action, action theory, ethics and history of philosophy. By downloading any of the following published papers you agree that it shall be for your own personal use. If you need material for any other purpose, please contact the publisher for permission. What makes a choice hard? I discuss and criticize three common answers and then make a proposal of my own. Paradigmatic hard choices are not hard because of our ignorance, the incommensurability of values, or the incomparability of the alternatives. They are hard because the alternatives are on a par; they are comparable, but one is not better than the other, and yet nor are they equally good. So understood, hard choices open up a new way of thinking about what it is to be a rational agent. Why believe that items can be on a par? This paper undermines the leading source of resistance to parity, offers sufficient conditions for parity, and suggests a natural way in which parity can arise from the simple idea that values have qualitative dimensions. This article explores the main similarities and differences between Derek Parfit’s notion of imprecise comparability and the related notion I have proposed of parity. I argue that imprecise comparability, insofar as it assumes ‘trichotomy’ – that if two items are comparable, one must be better than, worse than, or equal to the other – must be rejected. Instead, we should understand imprecise equality as parity, and imprecise comparability as entailing ‘tetrachotomy’ – that if two items are comparable, one must better than, worse than, equal to, or on a par with the other. I then illustrate the difference between Parfit’s notion of imprecise comparability and parity by examining how each notion might be employed in a solution to the problem posed by the Repugnant Conclusion in population ethics. I suggest that parity provides an arguably more ecumenical solution to the problem. This paper proposes a way to understand transformative choices, choices that change ‘who you are.’ First, it distinguishes two broad models of transformative choice: 1) ‘event-based’ transformative choices in which some event—perhaps an experience—downstream from a choice transforms you, and 2) ‘choice-based’ transformative choices in which the choice itself—and not something downstream from the choice—transforms you. Transformative choices are of interest primarily because they purport to pose a challenge to standard approaches to rational choice. An examination of the event-based transformative choices of L. A. Paul and Edna Ullman-Margalit, however, suggests that event-based transformative choices don’t raise any difficulties for standard approaches to rational choice. An account of choice-based transformative choices—and what it is to be transformed—is then proposed. Transformative choices so understood not only capture paradigmatic cases of transformative choice but also point the way to a different way of thinking about rational choice and agency. What, normatively speaking, are the grounds of (objective) rational choice? This paper defends ‘comparativism’, the view that a comparative fact grounds rational choice. It examines three of the most serious challenges to comparativism: 1) that sometimes what grounds rational choice is an exclusionary-type relation among alternatives; 2) that an absolute fact such as that it’s your duty or conforms to the Categorial Imperative grounds rational choice; and 3) that rational choice between incomparables is possible, and in particular, all that is needed for the possibility of rational choice is that one alternative is not worse than the others. Each challenge is questioned. If comparativism is correct, then no matter what normative theory you favor (utilitarianism, deontology, virtue theory, perfectionism, etc), your answer to the question, ‘What makes my choice rational?’ must be comparative in form. In this way, comparativism provides a framework for normative theorizing. This introductory article describes the phenomena of incommensurability and incomparability, how they are related, and why they are important. Since incomparability is the more significant phenomenon, the paper takes that as its focus. 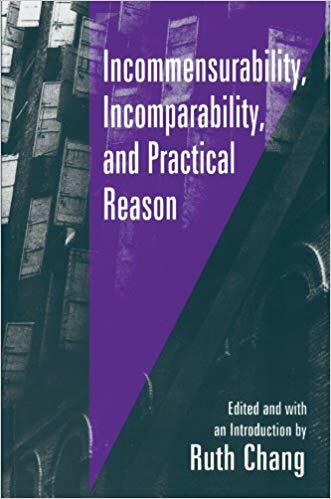 It gives a detailed account of what incomparability is, investigates the relation between the incomparability of values and the incomparability of alternatives for choice, distinguishes incomparability from the related phenomena of parity, indeterminacy, and noncomparability, and, finally, defends a view about practical justification that vindicates the importance of incomparability — assuming it exists — for practical reason. The paper has two aims. The first is to propose a general framework for organizing some central questions about normative practical reasons in a way that separates importantly distinct issues that are often run together. Setting out this framework provides a snapshot of the leading types of view about practical reasons as well as a deeper understanding of what are widely regarded to be some of their most serious difficulties. The second is to use the proposed framework to uncover and diagnose what I believe is a structural problem that plagues the debate about practical reasons. A common move in the debate involves a proponent of one type of view offering what she and others proposing that type consider to be a devastating criticism of an opposing type of view, only to find that her criticism is shrugged off by her opponents as easy to answer, misguided, or having little significance for their view. This isn’t due to conceptual blindness or mere slavish devotion to a theory but something fundamental about the argumentative structure of a debate over genuinely shared issues. Hence, the debate about practical reasons suffers from argumentative gridlock. The proposed framework helps us to see why this is so, and what we might do to move beyond it. This paper presents an argument against the widespread view that ‘hard choices’ are hard because of the incomparability of the alternatives. The argument has two parts. First, I argue that any plausible theory of practical reason must be ‘comparativist’ in form, that is, it must hold that a comparative relation between the alternatives with respect to what matters in the choice determines a justified choice in that situation. If comparativist views of practical reason are correct, however, the incomparabilist view of hard choices should be rejected. Incomparabilism about hard choices leads us to an implausible error theory about the phenomenology of hard choices, threatens an unattractive view of human agency, and leaves us in perplexity about what we are doing when we choose in hard choices. The second part of the argument explores the main competitor to comparativist views of practical reason, noncomparativist view, according tow which a choice is justified so long as it is not worse than any of the alternatives. This view is often assumed by rational choice theorists but has its best philosophical defense in work by Joseph Raz. On Raz’s view, incomparabilism about hard choices avoids the problems faced if comparativism is correct, but it faces different difficulties. I argue that Raz’s noncomparativist view mistakenly assimilates practical reason to more restricted normative domains such as the law. In virtue of what is something a reason for action? That is, what makes a consideration a reason to act? This is a metaphysical or meta-normative question about the grounding of reasons for action. The answer to the grounding question has been traditionally given in ‘pure’, univocal terms. This paper argues that there is good reason to understand the ground of practical normativity as a hybrid of traditional ‘pure’ views. The paper 1) surveys the three leading ‘pure’ answers to the question of a normative ground, 2) examines one or two of the most difficult problems for each, proposing along the way a new objection to one, and 3) argues that a particular hybrid view about normative grounds –‘hybrid voluntarism’ – avoids each of the main problems faced by the three leading ‘pure’ views. ‘Value pluralism’ as traditionally understood is the metaphysical thesis that there are many values that cannot be ‘reduced’ to a single supervalue. While it is widely assumed that value pluralism is true, the case for value pluralism depends on resolution of a neglected question in value theory: how are values properly individuated? Value pluralism has been thought to be important in two main ways. If values are plural, any theory that relies on value monism, for example, hedonistic utilitarianism, is mistaken. The plurality of values is also thought to raise problems for rational choice. If two irreducibly distinct values conflict, it seems that there is no common ground that justifies choosing one over the other. The metaphysical plurality of values does not, however, have the implications for rational choice that many have supposed. A charitable interpretation of value pluralist writings suggests a ‘nonreductive’ form of value pluralism. Nonreductive value pluralism maintains that in the context of practical choice, there are differences between values—whether or not those values reduce to a single supervalue—that have important implications for rational choice. This article examines the main arguments for metaphysical value pluralism, argues that metaphysical value pluralism does not have certain implications that it is widely thought to have, and outlines three forms of nonreductive value pluralism. This encyclopedia entry urges what it takes to be correctives to common (mis)understandings concerning the phenomenon of incommensurability and incomparability and briefly outlines some of their philosophical upshots. This paper investigates two puzzles in practical reason and proposes a solution to them. First, sometimes, when we are practically certain that neither of two alternatives is better than or as good as the other with respect to what matters in the choice between them, it nevertheless seems perfectly rational to continue to deliberate, and sometimes the result of that deliberation is a conclusion that one alternative is better, where there is no error in one’s previous judgment. Second, there are striking differences between rational agents – some rational agents have most reason to pursue careers on Wall Street while others have most reason to take up a career in teaching, or scuba diving, or working for political causes. These differences aren’t plausibly explained by ‘passive’ facts about our psychology or their causal interaction with our environment; instead, these facts seem in some sense to ‘express who we are’. But what is this sense? These puzzles disappear if we adopt a novel view about the source of the normativity of reasons – some reasons are given to us and others are reasons in virtue of an act of will. We make certain considerations reasons through an act of will and thus sometimes make it true through an act of agency that we have most reason to do one thing rather than another. This paper begins with a response to Josh Gert’s challenge that ‘on a par with’ is not a sui generis fourth value relation beyond ‘better than’, ‘worse than’, and ‘equally good’. It then explores two further questions: can parity be modeled by an interval representation of value? And what should one rationally do when faced with items on a par? I argue that an interval representation of value is incompatible with the possibility that items are on a par (a mathematical proof is given in the appendix). I also suggest that there are three senses of ‘rationally permissible’ which, once distinguished, show that parity does distinctive practical work that cannot be done by the usual trichotomy of relations or by incomparability. In this way, we have an additional argument for parity from the workings of practical reason. One of the most common judgments of normative life takes the following form: With respect to some things that matter, one item is better than the other, with respect to other things that matter, the other item is better, but all things considered – that is, taking into account all the things that matter – the one item is better than the other. In this paper, I explore how all-things-considered judgments are possible, assuming that they are. In particular, I examine the question of how the different considerations relevant to an all-things-considered judgment come together in a way that gives each relevant consideration its proper due. I propose an answer which provides a unified account of all-things-considered judgments and highlights a deep connection between value and reason. My suggestion is that ‘all things considered’ is, in effect, a placeholder for a more comprehensive, sometimes nameless, value that includes the things considered as parts, and that this more comprehensive value determines how the things considered normatively relate. What sorts of consideration can be normative reasons for action? If we systematize the wide variety of considerations that can be cited as normative reasons, do we find that there is a single kind of consideration that can always be a reason? Desire-based theorists think that the fact that you want something or would want it under certain evaluatively neutral conditions can always be your normative reason for action. Value-based theorists, by contrast, think that what plays that role are evaluative facts (or the facts that subvene them) about what you want, such as the fact that having it would be good in some way. This paper argues that value-based theorists are wrong; if we try to find a single kind of consideration that can always be normative reason, we find that sometimes our reason is the fact that we want something and not any corresponding evaluative fact. Conflicts between morality and prudence are often thought to pose a special problem because the normativity of moral considerations derives from a distinctively moral point of view, while the normativity of prudential considerations derives from a distinctively prudential point of view, and there is no way to ‘put together’ the two points of view. I argue that talk of points of view is a red herring, and that for any ‘prumoral’ conflict there is some or other more comprehensive value – often nameless – that accounts for the relative normative weight of conflicting moral and prudential considerations. The rational resolution of conflict is possible only in virtue of a more comprehensive value that includes the conflicting moral and prudential considerations as parts. This paper argues for the existence of a fourth positive generic value relation that can hold between two items beyond ‘better than’, ‘worse than’, and ‘equally good’: namely ‘on a par’. Recently, some of the leading proponents of the view that there is widespread incommensurability among goods have suggested that the incommensurability of some goods is a constitutive feature of the goods themselves. So, for example, a friendship and a million dollars are incommensurable because it is part of what it is to be a friendship that it be incommensurable with money. According to these ‘constitutive incommensurabilists’, incommensurability follows from the very nature of certain goods. In this paper, I examine this idea and argue that constitutive incommensurabilists have mistaken for constitutive incommensurability a particular emphatic kind of comparability. This examination involves an account of ‘higher’ and ‘lower’ goods and an explanation of how goods of different types figure in practical conflict. This paper gives an argumentative view of the philosophical landscape concerning incommensurability and incomparability. It argues that incomparability, not incommensurability, is the important phenomenon on which philosophers should be focusing and that the arguments for the existence of incomparability are so far not compelling. This used to be a five single-spaced page document passed around among friends, and we firmly believed that it augured an establishment destined to succeed. Unfortunately, the management (me) lost the original document, and what appears here, published in Ethics, is a mere shadow of the glorious original. It is the management’s hope that a new generation of philosophers, with nothing better to do, will take up the task of surpassing the original.